﻿International Beer Day: Calendar, History, Tweets, Facts, Quotes & Activities. International Beer Day celebrates the taste of beer and the achievement of beer brewers. Beer is an ancient alcoholic drink brewed mainly from malted barley, hops, yeast and water although it is possible to brew it from other grains such as maize, wheat and rice. Records of beer date back to 4000 BC, making it one of the oldest alcoholic beverages in the world. The three stated goals of the International Beer Day are to: appreciate brewers and servers, enjoy the taste of all beers from around the world, and to unite the world under the banner of beer. Founded in 2007 by the Association of California Brewers, International Beer Day has become an international event that is observed in more than 50 countries worldwide. It is held annually on the first Friday of August. 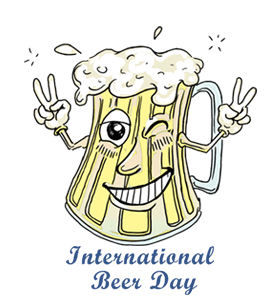 International Beer Day began in Santa Cruz, California, 2007. It was founded by beer enthusiasts, Jesse Avshalomov and Evan Hamilton. As far back as ancient Egypt, beer was a staple food. Known as Hqt, heqet or heket, beer was a thick and sweet source of nutrition including vitamins, minerals and protein that was consumed daily by adults and children. According to the Brewers Association, the Craft Brewing Industry contributed more than $55 billion to the U.S. economy in 2014, and provided more than 424,000 jobs. The U.S. beer market for 2014 was more than $101 billion. On average, a can of beer contains 100-150 calories and 10-15g carbohydrates. Visit your local watering hole and try a new beer that you have never had. 1) Dogfish Head, Milton, Del. 2) 2. Stone Brewing Company, Escondido, Calif.
3) Founders Brewing Company, Grand Rapids, Mich.
5) Lagunitas Brewing Company, Petaluma, Calif.